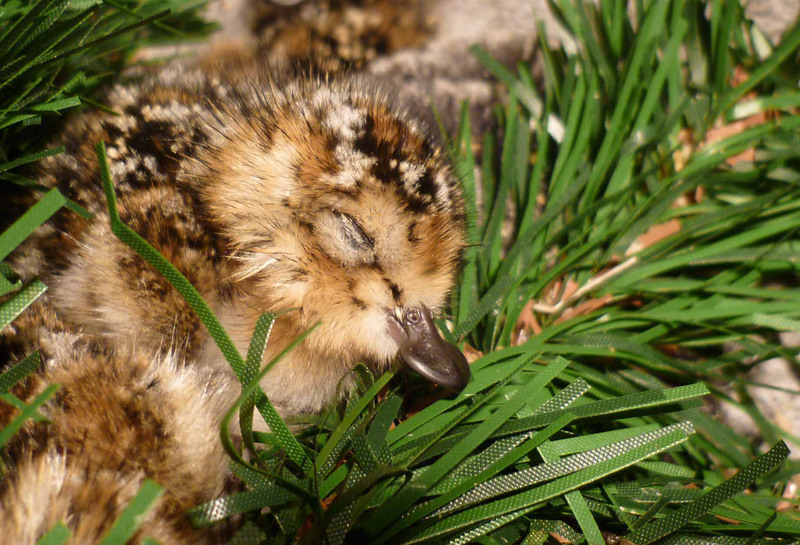 Saving the Spoon Billed Sandpiper » They’re here! Wow. What a day we had on Friday! I couldn’t sleep the night before. I woke up at 5.30am thinking how would 13 tiny little Spoon-billed Sandpipers cope with being boxed up for 17 hours and flown from Moscow to Heathrow and then driven to Slimbridge. My working day started at 6.05am when I got a text from Nige saying he’d just gone through passport control in Moscow, having left the Spoon-billed Sandpipers an hour ago. Then another text at 7.25am saying he was about to board, then another at 7.59am saying he was on board the plane and his feeling that “the spoon-billed sandpipers must be below me”. After dropping my daughter, Holly, off at school I headed to Slimbridge where I met up with the WWT team who had worked so hard to prepare for the arrival of our precious cargo. Rebecca Lee, Senior Species Conservation Officer and Nicki Hiscock, Conservation Breeding Assistant. The amount of preparatory work these guys have put in – dealing with logistics and preparing the quarantine station for the birds – cannot be underestimated. They’ve done a fantastic job. We then met with the team who would be travelling to Heathrow to pick up the birds and are briefed by Becs on our itinerary – put simply, drive to the City of London Corporation’s Animal Reception Centre at Heathrow in two cars, pick up the birds, one crate of birds in each car, on the way back. With the military precision planning of our Conservation Breeding Unit, it was actually more complicated than that, but I’ll spare you the details. 9.05am – we set off from Slimbridge. In one car there was Pete Cranswick, our Head of Species Recovery, and Michelle O’Brien, our vet. In the other, I shared a ride with our Head of Media, Sacha Dench, who would be filming the birds’ arrival. 10.00am – I’m driving along the M4 east to London. Sacha gets a call to say the plane is now due to land at 11.28am. 10.01am – we go a little faster. 11.00am – we arrive at the Animal Reception Centre in good time. And meet Animal Health Officer Stuart King, star of the BBC documentary television series “Airport” – basically the guy in charge of checking the birds over when they land, and in his own words “making sure they are what you say they are”. No mistaking spoon-billed sands, so hopefully no problem there! 11.35am – text from Nige saying they’ve landed. 11.45am – Stuart sets off to pick the birds up from the Aeroflot flight. 12.15pm – Stuart returns with the birds from the Aeroflot flight. He toots his horn at me as he drives into the Animal Reception Centre and gives me the thumbs up. I think … “the birds must be okay”. I hope. I hope … “the birds must be okay”. The birds are then offloaded and, through the mesh of a carrying crate (which Stuart said was one of the best carrying crates he had ever seen), I see, for the first time in my life, a spoon-billed sandpiper. Or, more accurately, I see 13 spoon-billed sandpipers, all alive and well and chirruping away to each other. A film crew immediately stick a camera in Pete’s face asking him how he feels. He does a fantastic job of describing the emotion of the moment. Glad they didn’t stick it in my face. I would have just burst into tears. 12.30pm – I pick Nige and Roland up from Terminal 4 and return to Animal Reception Centre. Then there was lots of checking birds and form filling and such stuff. Our thanks to Stuart and his staff at the City of London Corporation and to Liz Schickle, the vet, for fast-tracking the birds through the system. 2.15pm – we get on the road back to Slimbridge. The birds are mysteriously silent all the way home. Nige says they’re probably asleep and doesn’t seem worried. 4.15pm – we arrive at the Slimbridge quarantine station. Nige, Roland and the rest of the team go in to make the final checks to the facilities and prepare them for the birds. 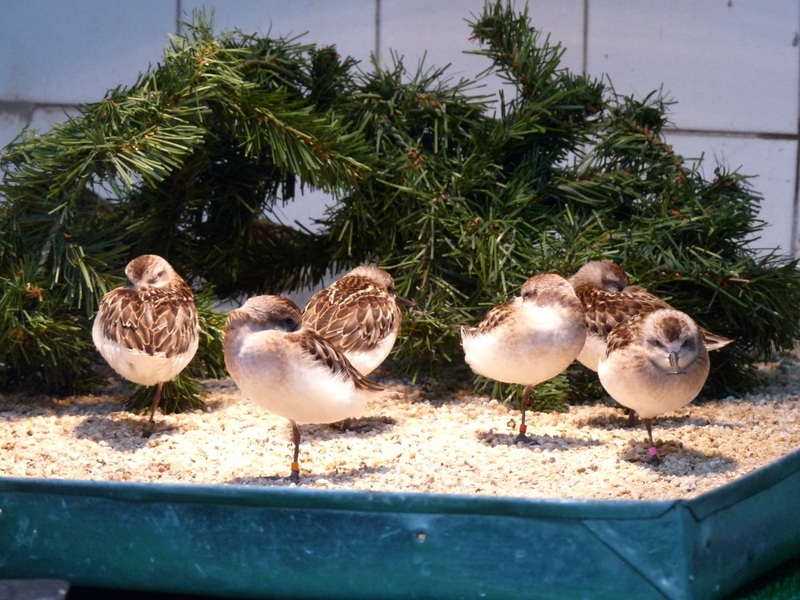 As well as providing food and water, they also put little artificial Christmas trees into the aviaries – sometimes the birds seek comfort from these (scroll down to see a photo of one of the spoon-billed sand chicks sleeping against one in Moscow). 4.30pm – Pete and I carry the precious crates of birds into the quarantine station and then leave the team to go and fill up the hire cars with petrol. 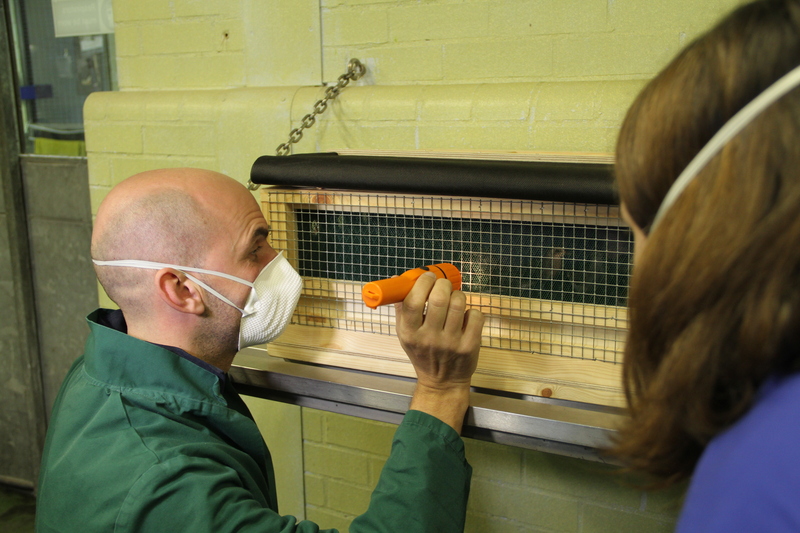 We leave the experts to it – examining the birds and putting them into their new accommodation. 5.15pm – everything is done. We now have three groups of four, four and five spoon-billed sandpipers in the quarantine station at Slimbridge. We stand in a circle outside the station discussing next steps. The whole team (those mentioned above plus Dr. Ruth Cromie, our Head of Wildlife Health) is strangely subdued (very, very unusually for this lot!). Even a day later, I’m not sure why this was. Because we were all tired? Undoubtedly. Not physically, but mentally exhausted. Or was it because we, subconsciously, realised what we’d achieved? I know that, despite the incredible amount of effort we’ve all put into this project, this is only the start, but to say I’m proud of our WWT Conservation Breeding Team, would be the understatement of my life. They are true “conservation heroes”. PS. 10.30pm. I think … “the birds are okay”… And go to sleep. Truly uplifting and thank you for sharing your excitement. Miraculous. Well done to everybody. I’ve been eagerly awaiting news of the spoon-billed sandpipers’ trip to Britain, and now here it is. They’ve arrived safely. What a huge relief. Congratulations to all involved. You deserve medals, all of you. Congrats everyone! More videos of the birds please! I was in tears watching this video. Truely fantastic achievement. Congratulatons to everyone involved – unbelievable. Congratulations to everyone involved. It’s made me so happy! Amazing achievement guys! So much hard work to get these little guys here! Congratulations ! It is a great news !!! I was waiting for this very good news for a long time ! Brilliant job! Congratulations to all concerned. Shipping any birds is nerve-wracking, but these – I can imagine! They look fantastic, well done all! A very emotional ‘watch’. Heard it on Radio 4 this morning, then fielded the texts from the friends who know I’m SBS-obsessed, but had to wait until now to get home and see it for myself online. Truly wonderful – can’t believe how calm you all looked. Congratulations to all the team on getting them this far. One step closer… Good luck. Congratulations to everyone for a magnificent effort. How enchanting the photos are and such a treat for me (who saw them as eggs and tiny chicks on board Professor Khromov arriving in Anadyr). I am sure they will settle in and really enjoy no longer having to be ‘on migration’. Has Christoph or any of the Russian team managed to come and see them in their new permanent home? I think the WWT is an incredible organisation and your staff and all the people who helped you with this mamoth undertaking are wonderful. Now hopefully this adorable bird will not go extinct. Fantastic news – well done to all of you. I loved the bit about having 4% of the world population in my boot! Hopefully one day, I’ll get to see one too. All 13 birds are still doing well in the quarantine station. No-one, apart from the five staff licensed to be in the station, has seen the birds since their arrival. And Nige is adamant that this will remain the case until the birds complete their 30 days in quarantine. As you can imagine, many people are keen to see them, but biosecurity has to be our priority. So Christoph didn’t get to see them when he visited on Sunday and today I had to tell our Chief Exec, Martin Spray, he couldn’t see them either! We do have CCTV cameras in the quarantine station, and will post more videos shortly. Fantastic news, well done everyone! Confirmed numbers at Yang Kou this autumn was a flock of 103 in October, all but one or two were adults. Still likely to be a handful there. I’m so glad to here the birds are all ok and finally at the end of their journey. i’ve been following you all for about six months and am amazed to hear all you accomplished and love all the pictures you share. Keep up all the great work your doing. Awesome, truly awesome. Can`t wait to see these little guys..if it`s possible? Congratulations team! Such a long way for those beautiful fragile little birds to travel. How they’ve grown since we brought them onto the Professor Khromov that glassy night in the Russian Far East! You guys are absolutely amazing to have given them such top-class, concentrated care for so many months – and I realise the journey is really just beginning! Good luck and well done! Congratulations everyone, what an amazing job! it seems so long ago that we last saw the cute wee chicks on board the ship! They have grown so much and we are looking forward to hearing more about their progress over the coming months! Well done to the team that has managed to achieve so much for this wonderful little wader. I hope all goes well so the species survives for us all to enjoy it. Great to see so many positive comments. I will be running the London Marathon for this project next April. Please go to http://www.justgiving.com/sandpiper if you’d like to be my first sponsor! Just a quick note to say that more blogs really are coming shortly. And also the videos I promised last week. Sorry – but we’ve been a bit busy lately – after the birds’ arrival we’re still chasing our tails a little – so to speak! The birds are all fit and healthy, and are being closely monitored via the high-tech, CCTV cameras in our Slimbridge quarantine facility. Once the Spoon-billed Sandpipers are safely installed in their purpose-built winter accommodation at Slimbridge in mid-December, we’re planning to stream live video footage into the Slimbridge visitor centre – so even if people won’t be able to see them close up yet, they’ll be able to watch them in real time from afar. Our WWT CCTV expert, Chris Baxendale, will shortly be fitting more cameras in the winter accommodation – right down at Spoon-billed Sandpiper eye level – so next time you’re visiting you’ll be able to see some great views of these wonderful birds. PS It’s great to see so many people from the “Heritage Expeditions expedition” posting on this blog – crew and passengers alike! Our sincere thanks to Heritage Expeditions for their support – we couldn’t have done it without you. I think we’re all just happy that they’re there. While they were in transit and ‘out of reach’, I was certainly nervous and needing news. Now they’re here, behind that rather ordinary-looking door I feel more reassured. Hope others feel the same. We’ll see the birds on CCTV when they’re out in their permanent home. Take this time to relax a bit in terms of the blog. You really didn’t want to hear the news when the birds were in quarantine and in transit – as there was so much uncertainty (and serious nail biting). At one point we thought we might not get the birds back to Slimbridge until next April. We therefore thought it best to limit the nervous wrecks to a few of us at Slimbridge. Huge thanks to Nigel Hewston for running the London Marathon to raise money for our conservation breeding project for Spoon-billed Sands. I think I have just managed to be his first sponsor. One of many hopefully. Nigel worked for WWT back in the old days – around when I started in short pants in 1987. If I remember correctly he was in the Slimbridge education team then became avicultural coordinator (a job that Nige Jarrett subsequently did). Hence his earlier blog post about knowing how nerve-wracking it is to move birds. Thanks Baz, that’s really got the ball rolling! The more people who join you by donating at http://www.justgiving.com/sandpiper, the easier the marathon training will be. I have also contributed to your Marathon fund. Well done you. Having seen Spoonies in the Russian Far East as well as other species that use the same flyway (in New Zealand etc.) and really need the tidal flats NOT to become harbours for chinese ships, etc. you are doing a wonderful thing. I just wish that most of your training was not in Wintertime. Good luck. Had the thrill of seeing spoon-billed sands in the Algarve in september.